When I was a kid my mom had her work cut out for her. I was an extremely picky child and hated almost every single food out there. I remember hiding my uneaten sandwich from lunch in the culvert in our driveway…not knowing my mom was watching me from the picture window in the living room. Oops. Thankfully, my kids did not inherit my extreme pickiness though they do have their moments! My 8 year old daughter, Bridget, has her preferences and I don’t mind taking her grocery shopping with me. I figure this way she can choose snacks she likes to eat. On our most recent shopping trip, I had her pick out some snacks that she wanted for lunch. In the produce section, she asked for strawberries while in the deli she wanted ham for her sandwiches. We also grabbed a bag of Goldfish crackers in Pizza flavour. For a drink, she selected Apple Juice that was unsweetened. I think she made some pretty good choices and I knew she would be more likely to eat everything since she picked them out herself. At home, we already had some Snack Pack pudding and Juicy Gels. The kids have been taking them in their lunches for years and they are always a hit. I have no worries about them not finishing them. Heck even John and I enjoy eating them too. The Juicy Gels are made with real fruit juice and are a fun treat for kids. The puddings are made with skim milk and have no preservatives or trans-fats. They are available in the classic flavours (chocolate, chocolate fudge, vanilla, butterscotch, tapioca) and dessert flavours (ice cream sandwich, lemon meringue pie, banana cream pie, chocolate caramel, toffee caramel). If you are counting calories, try Fat-Free Chocolate and Fat-Free Vanilla flavours as they have only 90 calories or less per serving. I made her a lunch that I knew she would eat and there were “no tradesies” going to happen here! 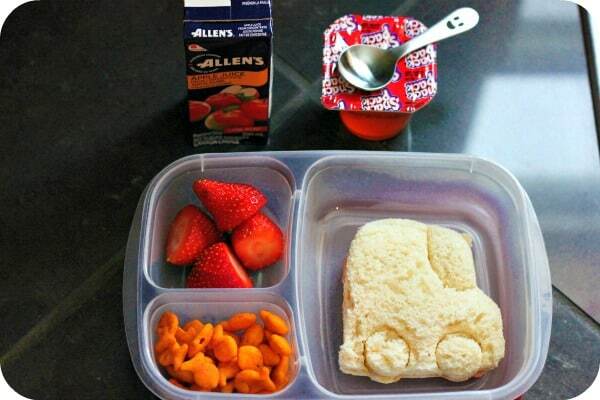 It included a ham & cheese sandwich in the shape of a car, Goldfish crackers (pizza flavour), strawberries, Apple Juice and a Snack Packs Orange Juicy Gel. And I was right. She ate the whole thing. 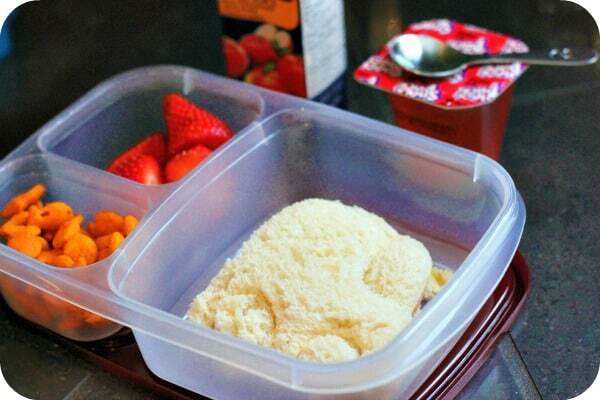 For more lunch packing ideas, check out the Snack Pack Canada Facebook page. One Canadian reader will win a Snack Pack “No Tradesies” prize pack containing two delicious flavours of Snack Pack pudding, Lunch Punch Sandwich Cutters, Happy Spoons, a mini portable travel speaker and a tote-able lunch bag consisting of a cooler bag and four leak-proof, compartmentalized food container (ARV $50)! I love the chocolate and vanilla ones! Ooooh! Banana Cream Pie is my favorite! Chocolate Fudge is my favorite. I like chocolate, it tastes good. I am an ultimate butterscotch pudding fan. 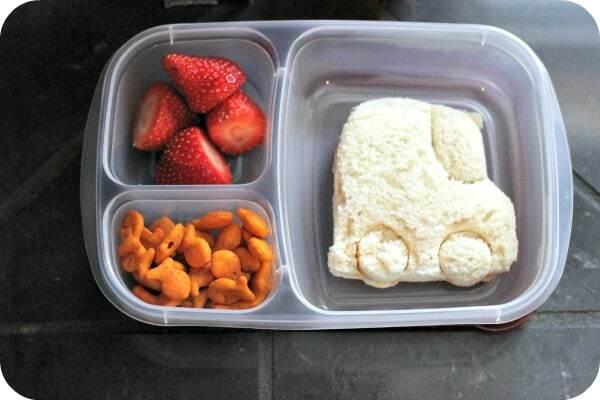 Such a cute lunch…love the little car, vroom, vroom!! My favourite flavour is butterscotch! Call me traditional but I’m more than happy with Vanilla!